Many people with cancer suffer from severe chronic pain for which opioids are indicated. Cancer organizations and the Food and Drug Administration want to broaden eligibility criteria for cancer clinical trials. 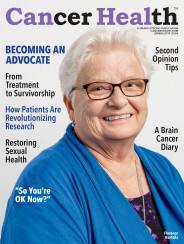 Florence Kurttila brings a patient’s insights to the world of colon cancer research. Cancer doesn’t have to bring sexual intimacy to an end. Yoga, meditation, acupuncture and more can be safely used to relieve side effects of standard treatment. Encourage wider participation of children, people with HIV and those with brain metastasis. Oncologists say that the care of older adults with cancer needs to be improved, and this new guideline may kickstart a positive change.